Jennylyn Mercado makes her Preview Magazine cover debut this April! It is definitely hot in here as Jennylyn Mercado makes her splashing cover debut on the cover of Preview Magazine. Please grab a copy of the April 2016 issue of Preview Magazine with the sultry summer funny girl, Romantic Comedy Queen, Jennylyn Mercado. Available in newsstands, bookstores, convenience stores, and supermarkets nationwide. Also available for download in digital format. The much anticipated romantic comedy flick, Just The 3 of Us official movie poster has been released. Produced by ABS-CBN's film outfit, Star Cinema offers an exciting new pair, Romantic Comedy Queen Jennylyn Mercado and Box Office King John Lloyd Cruz. Directed by Cathy Garcia Molina, Just The 3 of Us is set to open in cinemas this April. Award winning movie, English Only Please is now a Book! 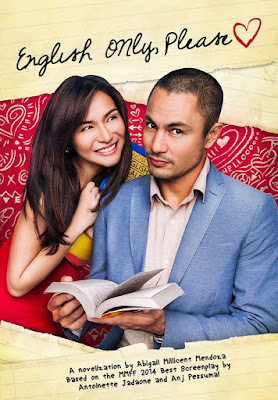 Jennylyn Mercado and Derek Ramsay starred box office romantic comedy flick, English Only Please is now officially a novel courtesy of Summit Books. The Metro Manila Film Festival 2014 award winning entry snagging 2nd Best Picture, Best Actress and Best Actor for Mercado and Ramsay, Best Director, and Best Screenplay to name a few is now in a new form to make the fans laugh and fall in love all over again. English Only Please is a story about about two people who consider themselves foolish when it comes to love, Julian Parker, a Fil-Am based in the United States, and an English tutor known as Tere Madlansacay. Julian who got his heart broken hired Tere to translate and help him recite his letter to his ex-girlfriend. Tere on the other hand had her own romantic drama with her so called on again and off again complicated relationship. After spending so much time together, Julian and Tere's foolish hearts eventually fall in love with each other. 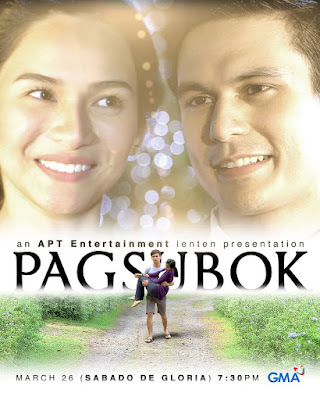 Jennylyn Mercado and Tom Rodriguez team up for the first time in APT's Lenten Special "Pagsubok"
This marks the first time these two GMA Network prized talents will work together on a project. Jennylyn will play the role of JL while on the other hand, Tom will play the role of Martin for this year's APT Entertainment Lenten special entitled "Pagsubok". JL and Martin, a newly wedded couple will face a difficult challenge in their marriage as JL becomes seriously ill. This will then test their love for each other after vowing to be with one another through sickness and health and for better or worse. Will their love and faith be enough to surpass this trial? Directed by the award winning film and TV director, Michael Tuviera comes a story that will surely touch your hearts. "Pagsubok" is set to air on Black Saturday, 7:30 in the evening on GMA Network.